This page includes all dealers who routinely carry stocks and bonds from North American railroads. Please understand, this listing is a FREE service. otherwise do business as a PROFESSIONAL dealer through want lists and other communications. maintain an eBay store site. routinely list sufficiently large numbers of certificates from North American railroads. Professional presentations and good images sell better than uniformative descriptions and ugly photos. Overselling third-rate autographs with long excerpts from Wikipedia screams amateur. you know a dealer has changed addresses, email, etc. Collectors: I strongly recommend you form relationships with dealers. It is extremely important that you find dealers you like. Good relationships are more important than prices. Click here for a discussion about high- and low-price dealers. 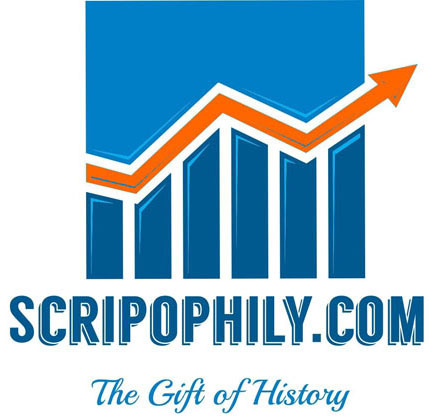 Also check the website of the Professional Scripophily Trade Association for links and descriptions of dealers who specialize in selling collectible stocks and bonds. NOTICE: A company's inclusion on this page does NOT constitute a positive endorsement. A company's absence is not a negative assessment. The owner of Alaska Rare Coins is also the author of Alaska & Yukon Stocks and Bonds.The book is 344 pages, 8.5 by 11 format, soft bound with full color glossy covers. Over 700 listings. Heavily illustrated with over 500 photos. Includes dates and places of incorporation, colors stock issued, descriptions of vignettes, sizes, printers and other information. Additional illustrations include prospectuses and historical photos. Please contact Alaska Rare Coins to purchase. Infrequent, geographically-focused listings/offerings for railroad/mining/miscellaneous stocks & bonds, ephemera, gift possibilities. Visit American Vignettes at collectables shows in CT, NJ, PA, VA. Call 908-241-4209 for recorded messages of upcoming events. Always buying early mining stocks. Stock certificates from a wide range of countries, including the U.S.
Stocks and bonds from most countries, including the U.S. Preeminent auction company for certificates, coins and currency. Archival Grade Polyester Enclosures including DuPont Mylar® D, DuPont Melinex® 516 , and Reemay® spunbonded polyester in sizes as small as 1-in x 1-in up to 60-in wide with unlimited length. Excellent European auction house with heavy North American content. Some very rare items appear in Gutowski's sales, including items seldom if ever offered in U.S. sales. Regular auctions, available in full color in Adobe Acrobat form. Selection of worldwide stocks and bonds including many from North America. Stocks and bonds, autographs. See website for hundreds of railroad certificates. Fixed price brochures available. Hundreds of rarities. Railroads, mining, telegraph, telephone, autos, oils, letters, Jay Gould, Lincoln, and the Vanderbilts. Prominent German dealer with full-color catalogs. Large periodic auctions through Freunde Historischer Wertpapiere. Online sales of German and American certificates in many categories. Coins, currency, stocks, bonds, paper ephemera, photographs, western Americana, postcards, sports cards. Major show dealer. Auctions, fixed prices lists, albums, and more. Major international live auctions in Brussels and Antwerp every 6 months. Online and printed catalogs available for every sale. Mario speaks several languages, so be comfortable contacting him about auctions and specific wants. Champion has a huge array of stamps, of course. BUT, it also carries banknotes and good selection of certificates. Contact if you live in New York for items not listed online. Wholesale Stocks and Bonds. Catalogs available with lots of railroad-related certificates; volume-based pricing. Mr. Priest says, "If it's paper, I'm interested." 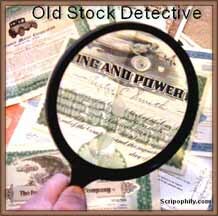 He buys, sells and trades railroad, hotel and steamship certificates of all types. He also deals in pocket maps, passes, financial documents, old business letterheads, enclosures, covers and envelopes as well as checks and other engraved items. Stocks and bonds, primarily American, in numerous categories. Buyer and seller of Confederate bonds. Large selection of Confederate-related material online. Online fixed-price list of many North American stocks and bonds. Great selection of all sorts of revenues, including revenue imprinted paper. 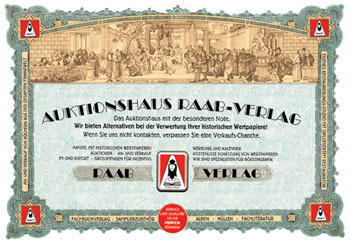 Online catalog including large selection of railroad-related certificates, both with and without revenues. Author of American Automobile Stock Certificates (BNR Press.) Major stock and bond dealer in many specialties, including railroads, automotive, aviation, utilities, manufacturing, and many, many more. One of the top European auctioneers of collectible stocks and bonds. Always offers a large selection of U.S.railroad certificates. Excellent color catalogs available for annual subscription. Easy purchase and shipping for U.S. buyers. Railroad stocks and bonds with a specialty in oil and mining stocks and bonds. Buys and sells autos, petroleum, turnpikes, autographs, banking, aviation and many other industries. Also municipals. Stocks, bonds, paper money, autographs, buy or bid sales and fixed price lists. Huge selection of all types of certificates ranging from the very common to astounding rarities. Large online selection. Offering a large selection of stock and bond certificates across a variety of industries. Offerings include detailed background information and high resolution images. Inventory is easily searchable. Fixed price catalogs, auctions, books. Mostly Western mining-related, but some railroad certificates. Primarily a philatelic auction company, but every sale offers a selection of railroad stocks and bonds. Online shop and periodic auctions with selections of North American certificates. Beautiful, four-color auction catalogs. Auction listings available online. Substantial number of U.S. railroad issues. Online price lists (text only) with European, Russian and American certificates. German language site, with online selection of North American certificates. Accepts Paypal. Auctions and online shop covering all world certificates, including U.S. railroads. Large, fully-illustrated, auction catalogs. Primary focus is western Americana, primarily mining-related. Almost all sales offer a few railroad certificates and artifacts. Affordable stocks and bonds, usually with multiple-item discounts available. The hobby was saddened by Clinton Hollins' passing on December 6, 2016. His daughter and stepson are carrying on the Hollins' tradition of huge inventory and affordable prices. Please visit their website for details. Auction catalogs available in both print and online form. Many U.S. railroad issues. Print editions are almost 200 pages long. Online store with certificates in all collectible categories, including railroads. 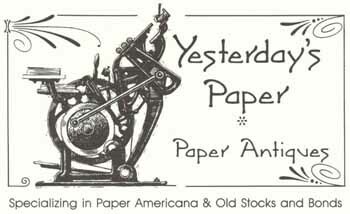 Fred also has a 250-page price guide for all types of certificates titled Antique Stock Certificate Almanac 2005. Please contact him for a copy. Wholesale quantities of diversified stocks and bonds. Immediate worldwide shipment. Online list of stocks, bonds and specimen. Large selection of Mexican curency. Prices in dollars. German language site; global certificates including North American railroad certificates. Research into old companies to help determine whether companies went out of business, whether companies doing business under different names, whether companies were acquired by others and how you can get in touch with the current company. Large selection of American certificates including railroad and coal issues. Established 2004, this association is a collection of dealer members who have committed to customer service, education, and highest ethical behavior. Online catalog in several categories, with small selection of American raildroads; autographs, etchings, prints, financial documents and original art. Antique, obsolete, and modern stocks and bonds. Bob is the organizer for the large February stock and bond show in Washington, DC. Stocks and bonds, autographs, historical documents. Auctions and fixed price catalogs. Online sales. Contact for a free copy of Winslow's comprehensively illustrated mail and phone auction catalog. Large store site covering stocks and bonds in all industries from around the globe. Huge selection of stocks and bonds from all countries including good selections of certificates from Mexico, Canada and the United states. Very reasonable prices. Online selection of about 1,000 stocks and bonds including autographed certificates and many railroad certificates. Well-rounded inventory with easy-to-find images and excellent selection of railroad certificates. Substantial amount of background information on companies. A FREE collectors magazine dedicated entirely to stocks and bonds. Developed in cooperation with HWPH Historisches Wertpapierhaus AG. Site is still active, but I am told there have not been any issues since 2014. Please sign up and contact Herr Volker for plans. Large list of global certificates, including U.S. Sells certificates framed and unframed. Longtime (since 1666!!) dealer in coins, banknotes, and medals. In Jan, 2008, Spink established a new Bond and Share Department with the acquisition of Michael Veissid's Collector's Gallery. Successor to R M Smythe Co. and still involved in stock and bond sales through its online and live auctions. See its current auctions by first starting at the main www.spink.com Spink site and clicking on the Spink USA tab. American or Canadian stock certificate research. Research is my expertise and if I can't tell you the status of your old stock market securities then my stock research service is FREE! Lots of North American stocks and bonds including a good selection of railroads. Stocks, bonds, letterheads. Longtime show dealer.